We had such a great response from our interview with Claire Pettibone, we thought you would like to learn more about the creators behind your favorite wedding brands. Who are the faces behind your lacey gown, blushing floral crown, crafty table numbers and that scrumptious cake? Well... we are going to introduce you to a few of them. 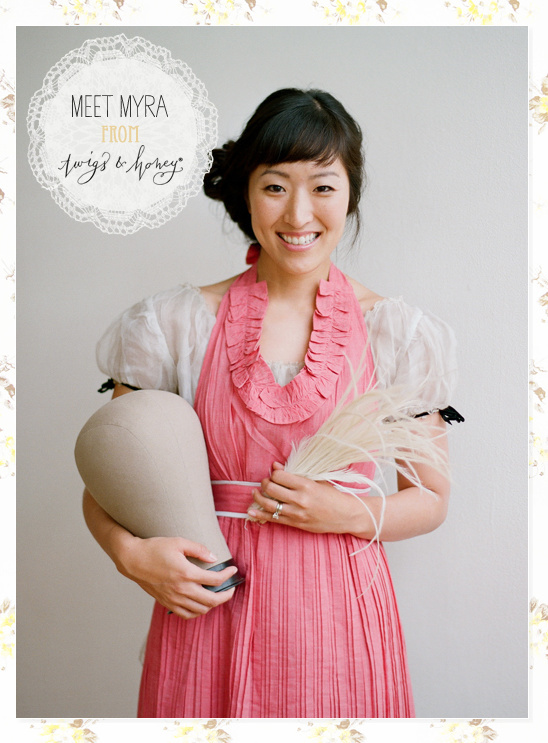 Meet Myra, the creator and enchantress behind Twigs & Honey. We had the lovely pleasure of meeting Miss Myra on our Wedding Chicks Happy Hour. To say the least, she was incredibly charming and oh-so-humble. Read on to learn more about Myra, who answered every single one of our questions. Such a fun read and you will learn so much about Myra. WC: Pease share something about you that may surprise our readers?I have a letter and syllable counting addiction. I count letters in conversation, signage – anywhere, really. And then in split seconds, I formulate weird calculations in my head so letters become multiples of 4. Don’t ask me why. It used to be a huge problem, but I’ve gotten a good handle on it now.WC: How you would describe your personal style?My style is mostly carefree, off kilter and slightly androgynous. I like neutral colors. I’m rarely in bright colors and you will probably never see me wear red.WC: What is your absolute favorite color to wear and what is your wardrobe staple?I love lavender against my skin tone, but I mostly wear black. My wardrobe staple is my collection of jackets. I have a TON of jackets & coats. I might wear the same variation of an outfit nearly every day, but I love to mix up my jackets.WC: If we were to meet for coffee, what would you wear?Most likely, I’d wear black leggings or tights with a tunic and sky high heels – topped with a jacket, of course. Strangely enough, I probably wouldn’t wear accessories. I like to keep my personal style simple.WC: What are you wearing right now?A nearly decade old, pale blue, fleece sweater, t-shirt and green cargo pants – typing on the couch. When I’m at home, it’s all about comfort. WC: What is your favorite beauty product?Crème de la mer WC: Your favorite song at the moment is ..Toad the Wet Sprocket – Fly From HeavenWC: What inspires you to create?My constant need to express my ideas. I am perpetually inspired by fashion and cannot stop thinking about pretty things. Creating helps me empty my brain of all the pretty ideas I’m thinking of. I think I would go a little nutty if I didn’t create all the time.WC: Who inspired you?My mom. She handmade and sewed things all during my childhood. She also made floral arrangements for church and weddings. I picked up a lot of my creativity from her.WC: Who are you favorite designers?Bigger names: Vera Wang, Elie Saab, Monique Lhuillier, Jenny Packham, Claire PettiboneIndie designers: Elizabeth Dye, Kate Towers, Leanne Marshall, Holly StalderWC: When you have an idea or vision (as we refer to it) what do you do? ex: write it on paper, email yourself, text yourself?I like to make sketches and take descriptive notes. I have about half a dozen sketch books floating around our home. I have sketch books in multiple bags, on the nightstand, at my desk, on the coffee table – anywhere I spend time. Speaking of which, I LOVE receiving sketch books as gifts and my husband gets most of them for me.WC: Can you give advice to a bride who wants to accessorize her look?Pick something that speaks to you and your personal style. If you can’t stop thinking of “that one” style you saw, get it. Have fun on your wedding day! Wear a piece that makes you feel like you, only a little more festive and celebratory!WC: What advice would you give a bride who is wants to bring her personal style into her wedding attire?I would say, go for it. I think a bride looks the most confident and happy when they wear something that really suits their personal style. Don’t let your wedding day sway you into wearing something you think you should wear but what doesn’t feel like your personal style at all. Wear something that reflects your own style and what makes you feel the most beautiful.WC: Tell us a little about your workspace.It’s functional. I have a studio at home and an outside space. My home studio has a stand up workstation because I hate sitting for long periods of time. It’s cluttered most of the time because every time I try to get into the habit of putting things away when I’m finished with them, I end up getting too busy. I also work with so many different materials and tools that a ton pours out of my shelves and drawers for projects and orders. I do make it a habit to do a deep clean every few weeks where I put everything away and let the vicious cycle start all over again. My outside studio is much more tidy and I like to keep it organized at all times for my workers.WC: Do you work alone or do you have a so-to-speak right hand man who knows you as well as you do?I work mostly alone. I do have an awesome contract worker and my mom helps as well.WC: How do you measure success?By how satisfied you are.WC: Coffee or tea?TeaWC: Chocolate or Vanilla?ChocolateWC: Salad or burger?SaladWC: Flats or heels?Heels – 4” + please!WC: Dogs or Cats?Dogs – by far! I absolutely abhor cats (sorry cat owners/lovers). Kittens are sometimes cute… but then they turn into CATS so they’re not cool either.How much did you love meeting Myra from Twigs & Honey? Stay tuned because we have more from Twigs & Honey . If you read this far you will be first in the loop to hear that a giveaway is only moments away from Myra. Stay tuned.